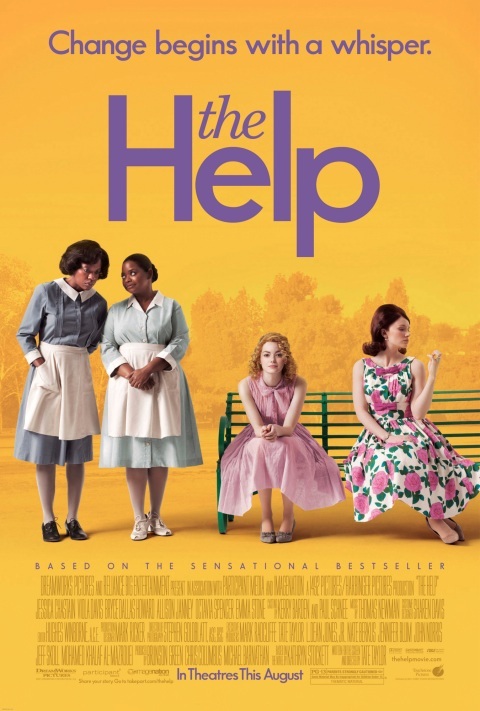 The movie version of Kathryn Stockett’s debut novel, The Help, eliminates one of the book’s main problems: Stockett’s inartful and controversial use of dialect in writing the first-person narratives of black maids in Jackson, Mississippi in the early 1960s. The book, to some readers’ dismay, is rife with “Law have mercys” and “Don’t you go sassing this white lady like you done the other.” Unless you are William Faulkner or Truman Capote or Flannery O’Connor, Southern black dialect is probably a thing you should avoid. The movie, adapted and directed by Tate Taylor, places the dialogue in the mouths of some fine actresses, and the effect is much more natural than Stockett’s clunky prose on the page. The film gets more directly to the heart of the story, which is about the uncomfortable and often dangerous pre-civil rights relations between the races, focusing especially on the black women who cook, clean and raise the children of white women who treat them like chattel -- and sometimes like disease-carrying aliens. Some of the maids have raised generations of children, whose children grow up to be just like them – heirs to a corrupt system of white privilege and de facto slavery. Stockett, a native of Jackson, based the book on her own childhood relationship with her family’s kindly and supportive maid. She also apparently borrowed from the stories of some maids in Jackson, one of whom has filed a lawsuit against her for $75,000. In the story, Stockett’s stand-in is Eugenia “Skeeter” Phelan (Emma Stone, an inspired casting choice but not the least Southern), a recent college graduate with ambitions to be a novelist. She lands a job at a daily newspaper writing a housekeeping column, a subject that leads her to consult with the various maids employed by her “society” friends. 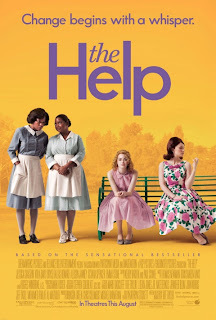 Skeeter has a special affinity for “the help”; her childhood confidante and comforter was her family’s maid, Constantine (the redoubtable Cicely Tyson), who left the family’s employ while Skeeter was away at school. Skeeter’s childhood chum Hilly Holbrook (Bryce Dallas Howard), the meanest white lady in town, tries to enlist Skeeter in a repulsive campaign to pass a law requiring that maids use outhouses rather than share the bathrooms of their white employers. Skeeter will have none of it. Skeeter interests a New York editor (Mary Steenburgen) in a book written from the perspective of black maids, and enlists the reluctant Aibileen (Viola Davis), the feisty Minny (Octavia Spencer) and a dozen other maids to tell the stories of their lives and work in the service of white people, a truth-telling endeavor that is dangerous in early-‘60s Mississippi – the state famously condemned for its racist cruelty in songs by Phil Ochs and Nina Simone (“Mississippi Goddam”). The movie is at its best when expressing Stockett’s sympathy for the unique relationships between black women and the white children they raise, a circumstance that still exists today. One of Skeeter’s first questions of Aibileen is, “How does it feel to raise white people’s children while your own children are being looked after by someone else?” The emotional bonds are movingly dramatized: Abileen teaches her charge, a chubby, neglected toddler she calls Baby Girl, an empowering mantra: “You is kind, you is smart, you is important,” and the little girl cries piteously when "Aibee" – her “real” mama -- is fired. Skeeter finally learns the real reason Constantine left her mother’s employ, an act of thoughtless bigotry that can never be rectified. While it attains some emotional heights, Stockett’s storytelling also plumbs the depths of taste. As the aforementioned toilet story suggests, the author has an unfortunate predilection for bathroom themes, not all of which make it into the movie. Here, from the book, is one maid’s perspective on “Gone With the Wind”: “If I’d played Mammy, I’d of told Scarlett to stick those green draperies up her white little pooper.” It’s emblematic of the author’s style that the movie’s climax (spoiler alert) involves an act of revenge using a pie baked with human feces, an incident that suggest psychosis rather than the human dignity the story means to demonstrate. The movie has a pop-Southern Gothic tone that includes elements of the macabre that recall the likes of Fried Green Tomatoes (with poop instead of dead bodies being served as cuisine). It bears the hallmark of its Disney origins, with a slick, television-style faux period veneer. In attempting to squeeze in an entire novel – even at the numbing length of 137 minutes – some plot threads and characters (like Hilly’s mother, played by Sissy Spacek) are merely sketched in. Others are caricatures, like Hilly, who can’t be just a racist but must also be an absolute monster — a tendency to exaggerate that afflicts many movies about race made by white people (see THE COLOR PURPLE and PRECIOUS). While the movie has a superb cast and contains many deeply moving scenes, it’s undermined by cartoonishness and Stockett’s infantile latrine fixation. 2 3/4 out of 4 stars.